C3yoyodesign - Out of this world! The Apparition is the signature yo-yo of EYYC 1A Champion and C3 Czech Republic Team Member Tomas Bubak! This new signature yo-yo was something a little different for C3yoyodesign; they worked with different finishes, new shapes, and a really beautiful curved straight v-shape profile. This new profile design makes the Apparition extremely maneuverable and easy to control which is exactly what Tomas Bubak needs for his style. All it takes is a little push and you can easily change from front style to horizontal and even 3D tricks. The Apparition is finished with a beautiful interior sand blast for easy grinds and an impeccable weight distribution that will give you spin for days. 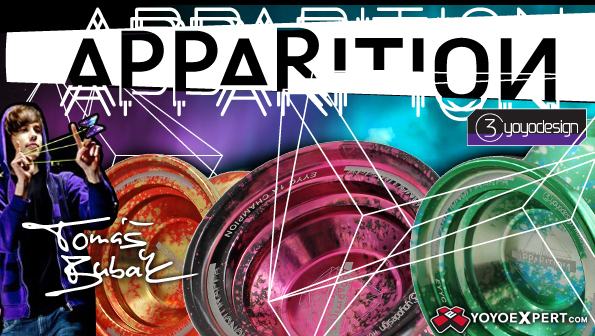 Just give it one throw and you will agree the Apparition is out of this world!